This chapter describes the Oracle operational best practices that can tolerate or manage each unscheduled outage type and minimize downtime. Chapter 14, "Reducing Downtime for Planned Maintenance" for information about scheduled outages. This section describes unscheduled outages that affect the primary or secondary site components, and describes the recommended methods to repair or minimize the downtime associated with each outage. Your monitoring and high availability infrastructure should provide rapid detection and recovery from downtime. Chapter 12, "Monitoring for High Availability" describes detection, while this chapter focuses on reducing downtime. Solutions for unscheduled outages are critical for maximum availability of the system. Table 13-1 compares the most common Oracle high availability architectures and summarizes the recovery steps for unscheduled outages on the primary site. For outages that require multiple recovery steps, the table includes links to the detailed descriptions in Section 13.2, "Recovering from Unscheduled Outages". Section 13.2.2, "Database Failover with a Standby Database"
Section 13.2.1, "Complete Site Failover (Failover to Secondary Site)"
Restore cluster or restore at least one node. Optionally restore from tape backups if the data is lost or corrupted. Managed automatically by Section 13.2.3, "Oracle RAC Recovery for Unscheduled Outages (for Node or Instance Failures)"
Section 13.2.5, "Oracle ASM Recovery After Disk and Storage Failures"
Section 13.2.6, "Recovering from Data Corruption"
Possible no downtime with Active Data Guard: Section 13.2.6.2, "Use Active Data Guard"
Section 13.2.7, "Recovering from Human Error (Recovery with Flashback)"
Footnote 2 Recovery time indicated applies to database and existing connection failover. Network connection changes and other site-specific failover activities may lengthen overall recovery time. Footnote 3 Recovery time consists largely of the time it takes to restart the failed system. Footnote 4 Database is still available, but portion of application connected to failed system is temporarily affected. Footnote 5 Storage failures are prevented by using Oracle ASM with mirroring and its automatic rebalance capability. Footnote 6 Recovery times from human errors depend primarily on detection time. If it takes seconds to detect a malicious DML or DLL transaction, then it typically only requires seconds to flash back the appropriate transactions, if properly rehearsed. Referential or integrity constraints must be considered. Footnote 7 Oracle Enterprise Manager or a customized application heartbeat can be configured to detect application or response time slowdown and react to these SLA breaches. For example, you can configure the Enterprise Manager Beacon to monitor and detect application response times. Then, after a certain threshold expires, Enterprise Manager can alert and possibly restart the database. Footnote 8 Oracle Enterprise Manager or a customized application heartbeat can be configured to detect application or response time slowdown and react to these SLA breaches. For example, you can configure the Enterprise Manager Beacon to monitor and detect application response times. Then, after a certain threshold expires, Enterprise Manager can call the Oracle Data Guard DBMS_DG.INITIATE_FS_FAILOVER PL/SQL procedure to initiate a failover. 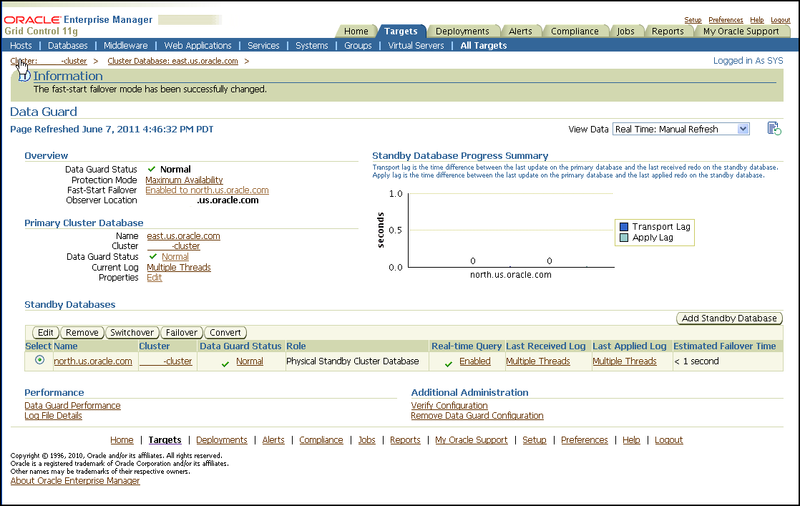 Oracle Data Guard Broker for more information about "Application Initiated Fast-Start Failover"
Outages on the standby site do not impact the availability of the primary database when using Data Guard Maximum Availability (synchronous communication with net_timeout) or Maximum Performance (asynchronous communication). Outages to a system that uses the Active Data Guard option with the standby database can affect applications that are using the standby database for read activity, but such outages do not impact the availability of the primary database (the availability is based on the mode you specify). Data Guard Maximum Protection, however, has an impact on availability if the primary database does not receive acknowledgment from a standby database running in SYNC transport mode (net_timeout does not apply to Maximum Protection). For this reason, if you are using Maximum Protection you should follow the MAA best practice of deploying two SYNC standby databases, each at its own site. With two standby databases a single standby outage does not impact primary availability or zero data loss protection. If limited system resources make it impractical to deploy two standby databases, then the availability of the primary database can be restored simply by downgrading the data protection mode to Maximum Availability and restarting the primary database. Table 13-2 summarizes the recovery steps for unscheduled outages of the standby database on the secondary site. For outages that require multiple recovery steps, the table includes links to the detailed descriptions in Section 13.2, "Recovering from Unscheduled Outages". Restart node and standby instance when they are available. The broker automatically restarts the log apply services. Note 1: If there is only one standby database and if Maximum Protection is configured, then the primary database shuts down to ensure that there is no data divergence with the standby database (no unprotected data). Note 2: If this is an Oracle RAC standby database, then there is no affect on primary database availability if you configured the primary database Oracle Net descriptor to use connect-time failover to an available standby instance. If you are using the broker, connect-time failover is configured automatically. Section 13.3.5, "Restoring Fault Tolerance After a Standby Database Data Failure"
Section 13.3.6, "Restoring Fault Tolerance After the Primary Database Was Opened Resetlogs"
Section 9.1, "Oracle Data Guard Configuration Best Practices"
Oracle Data Guard Concepts and Administration for information about "Data Guard Protection Modes"
Oracle Data Guard Broker for information about "How the Protection Modes Influence Broker Operations"
This section describes best practices for recovering from various types of unscheduled outages. With complete site failover, the database, the middle-tier application server, and all user connections fail over to a secondary site that is prepared to handle the production load. Use the Data Guard configuration best practices in Section 9.3, "General Data Guard Configuration Best Practices"
Chapter 11, "Configuring Fast Connection Failover"
Configure Automatic Domain Name Server (DNS) failover procedure. Automatic DNS failover occurs after a primary site is inaccessible and the wide-area traffic manager at the secondary site returns the virtual IP address of a load balancer at the secondary site and clients are directed automatically on the subsequent reconnect. The potential for data loss is dependent on the Data Guard protection mode used: Maximum Protection, Maximum Availability, or Maximum Performance. A wide-area traffic manager on the primary and secondary sites provides the site failover function. The wide-area traffic manager can redirect traffic automatically if the primary site, or a specific application on the primary site, is not accessible. It can also be triggered manually to switch to the secondary site for switchovers. Traffic is directed to the secondary site only when the primary site cannot provide service due to an outage or after a switchover. If the primary site fails, then user traffic is directed to the secondary site automatically. Client requests enter the client tier of the primary site and travel by the WAN traffic manager. Client requests are sent through the firewall into the demilitarized zone (DMZ) to the application server tier. Requests are forwarded through the active load balancer to the application servers. Requests are sent through another firewall and into the database server tier. The application requests, if required, are routed to an Oracle RAC instance. Responses are sent back to the application and clients by a similar path. Description of "Figure 13-1 Network Routes Before Site Failover"
Figure 13-2 illustrates the network routes after site failover. Client or application requests enter the secondary site at the client tier and follow the same path on the secondary site that they followed on the primary site. Description of "Figure 13-2 Network Routes After Site Failover"
The administrator has failed over or switched over the primary database to the secondary site. This is automatic if you are using Data Guard fast-start failover. The administrator starts the middle-tier application servers on the secondary site, if they are not running. 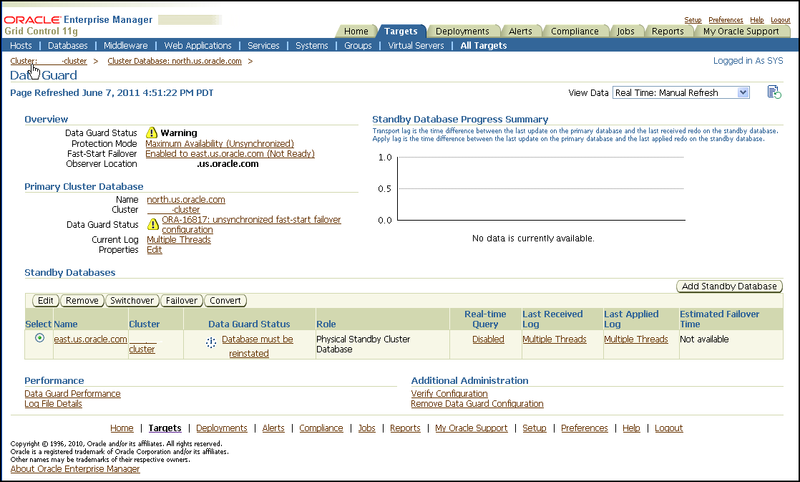 The wide-area traffic manager selection of the secondary site can be automatic for an entire site failure. The wide-area traffic manager at the secondary site returns the virtual IP address of a load balancer at the secondary site and clients are directed automatically on the subsequent reconnect. In this scenario, the site failover is accomplished by an automatic domain name system (DNS) failover. The master (primary) DNS server is updated with the zone information, and the change is announced with the DNS NOTIFY announcement. The slave DNS servers are notified of the zone update with a DNS NOTIFY announcement, and the slave DNS servers pull the zone information. The master and slave servers are authoritative name servers. Therefore, they contain trusted DNS information. Clear affected records from caching DNS servers. A caching DNS server is used primarily for performance and fast response. The caching server obtains information from an authoritative DNS server in response to a host query and then saves (caches) the data locally. On a second or subsequent request for the same data, the caching DNS server responds with its locally stored data (the cache) until the time-to-live (TTL) value of the response expires. At this time, the server refreshes the data from the zone master. If the DNS record is changed on the primary DNS server, then the caching DNS server does not pick up the change for cached records until TTL expires. Flushing the cache forces the caching DNS server to go to an authoritative DNS server again for the updated DNS information. BIND 9.3.0: The command rndc flushname name flushes individual entries from the cache. BIND 9.2.0 and 9.2.1: The entire cache can be flushed with the command rndc flush. BIND 8 and BIND 9 up to 9.1.3: Restarting the named server clears the cache. Refresh local DNS service caching. Some operating systems might cache DNS information locally in the local name service cache. If so, this cache must also be cleared so that DNS updates are recognized quickly. The secondary site load balancer directs traffic to the secondary site middle-tier application server. The secondary site is ready to take client requests. Failover also depends on the client's web browser. Most browser applications cache the DNS entry for a period. Consequently, sessions in progress during an outage might not fail over until the cache timeout expires. To resume service to such clients, close the browser and restart it. Failover is the operation of transitioning one standby database to the role of primary database. A failover operation is invoked when an unplanned failure occurs on the primary database and there is no possibility of recovering the primary database in a timely fashion. Fast-start failover eliminates the uncertainty of a process that requires manual intervention and automatically executes a zero loss or minimum-loss failover (that you configure using the FastStartFailoverLagLimit property) within seconds of an outage being detected. See Section 9.4.2.3, "Fast-Start Failover Best Practices" for configuration best practices. See Section 13.2.2.3, "Best Practices for Performing Manual Failover". A database failover is accompanied by an application failover and, in some cases, preceded by a site failover. After the Data Guard failover, the secondary site hosts the primary database. You must reinstate the original primary database as a new standby database to restore fault tolerance of the configuration. See Section 13.3.2, "Restoring a Standby Database After a Failover." A failover operation typically occurs in under a minute, and with little or no data loss. When a primary database failure cannot be repaired in time to meet your Recovery Time Objective (RTO) using local backups or Flashback technology, you should perform a failover using Oracle Data Guard. A failover requires that you reinstate the initial primary database as a standby database to restore fault tolerance to your environment. You can quickly reinstate the standby database using Flashback Database provided the original primary database has not been damaged. See Section 13.3.2, "Restoring a Standby Database After a Failover." A fast-start failover is completely automated and requires no user intervention. There are no procedural best practices to consider when performing a fast-start failover. However, it is important to address all of the configuration best practices described in Section 9.4.2.3, "Fast-Start Failover Best Practices". Follow the configuration best practices outlined in Section 9.4.2.4, "Manual Failover Best Practices." See Oracle Data Guard Broker for complete information about how to perform a manual failover using Oracle Enterprise Manager. The procedure is the same for both physical and logical standby databases. Oracle Data Guard Concepts and Administration for information about Physical standby database steps for "Performing a Failover to a Physical Standby Database"
Oracle Data Guard Concepts and Administration for information about Logical standby database steps for "Performing a Failover to a Logical Standby Database"
Oracle RAC Recovery is performed automatically when there is a node or instance failure. In regular multi instance Oracle RAC environments, surviving instances automatically recover the failed instances and potentially aid in the automatic client failover. Recover times can be bounded by adopting the database and Oracle RAC configuration best practices and can usually lead to instance recovery times of seconds to minutes in very large busy systems, with no data loss. For Oracle RAC One Node configurations recover times are expected to take longer than full Oracle RAC; with Oracle RAC One Node a replacement instance must be started first before it can do the instance recovery. Instance failure occurs when software or hardware problems cause an instance to shutdown or abort. After instance failure, Oracle automatically uses the online redo log file to perform database recovery. Instance recovery in Oracle RAC does not include restarting the failed instance or the recovery of applications that were running on the failed instance. Applications will run continuously using service relocation and fast application notification (as described in Section 13.2.3.2, "Automatic Service Relocation"). When multiple instances fail, if one instance survives Oracle RAC performs instance recovery for any other instances that fail. If all instances of an Oracle RAC database fail, then on subsequent restart of any instance a crash recovery occurs and all committed transactions are recovered. Data Guard is the recommended solution to survive outages when all instances of a cluster fail. Oracle Clusterware automatically moves any services on the failed database instance to another available instance, as configured with DBCA or Enterprise Manager. Oracle Clusterware recognizes when a failure affects a service and automatically fails over the service across the surviving instances supporting the service. With Oracle RAC One Node the relocation occurs when another instance on a different node is started and enabled for the appropriate services. Thus, Oracle RAC One Node starts a new instance when an instance fails but the new instance is not a "surviving instance." A service can be made available on multiple instances by default. In this case, when one of those multiple instances is lost the clients continue to use the available services across the surviving instances, but there are less resources to do the work. In parallel, Oracle Clusterware attempts to restart and integrate the failed instances and dependent resources back into the system and Cluster Ready Services (CRS) will try to restart the database instance three times. Clients can "subscribe" to node failure events, in this way clients can be notified of instance problems quickly and new connections can be setup (Oracle Clusterware does not setup the new connections, the clients setup the new connections). Notification of failures using fast application notification (FAN) events occur at various levels within the Oracle Server architecture. The response can include notifying external parties through Oracle Notification Service (ONS), advanced queuing, or FAN callouts, recording the fault for tracking, event logging, and interrupting applications. Notification occurs from a surviving node when the failed node is out of service. The location and number of nodes serving a service is transparent to applications. Restart and recovery after a node shutdown or clusterware restart are done automatically. Loss of the Oracle Cluster Registry (OCR) file affects the availability of Oracle RAC and Oracle Clusterware. The OCR file can be restored from a backup that is automatically created or from an export file that is manually created by using the ocrconfig tool (also use ocrconfig to restore the backup). Additionally, Oracle can optionally mirror the OCR so that a single OCR device failure can be tolerated. Ensure the OCR mirror is on a physically separate device and preferably on a separate controller. For more information, see Section 6.2.7, "Mirror Oracle Cluster Registry (OCR) and Configure Multiple Voting Disks with Oracle ASM". If all of the voting disks are corrupted, then you must restore them. To do this you use the crsctl command. The steps you use depend on where you store your voting files. If the voting disks are stored in Oracle ASM, then run the commands to migrate the voting disks to the Oracle ASM disk group you specify, with: crsctl replace votedisk. If you did not store voting disks in Oracle ASM, then you run the commands to delete and add the voting disks: crsctl delete css votedisk and crsctl add css votedisk. Section 6.3.2, "Regularly Back Up OCR to Tape or Offsite"
With a minimal configuration, applications can receive fast and efficient notification when instances providing services become unavailable. When notified, application reconnects occur transparently to the surviving instances of an Oracle RAC database or to a standby database that has assumed the primary role following a failover. In an Oracle RAC configuration, services are essential to achieving fast and transparent application failover. Clients are notified of a service relocation through Fast Application Notification (FAN). In an Oracle Data Guard configuration, you can configure services for client failover across sites. After a site failure in a Data Guard configuration, the new primary database can automatically publish the production service while notifying affected clients, through FAN events, that the services are no longer available on the failed primary database. For hangs or situations in which the response time is unacceptable, you can configure Oracle Enterprise Manager or a custom application heartbeat to detect application or response time slowdown and react to these situations. For example, you can configure the Enterprise Manager Beacon to monitor and detect application response times. Then, after a certain time threshold expires, Enterprise Manager can call the Oracle Data Guard DBMS_DG.INITIATE_FS_FAILOVER PL/SQL procedure to initiate a database failover immediately followed by an application failover using FAN notifications and service relocation. FAN notifications and service relocation enable automatic and fast redirection of clients if any failure or planned maintenance results in an Oracle RAC or Oracle Data Guard fail over. Table 13-3 summarizes the impacts and recommended repairs for various Oracle ASM failure types. Automatic Section 13.2.3, "Oracle RAC Recovery for Unscheduled Outages (for Node or Instance Failures)"
Oracle ASM automatically rebalances to the remaining disk drives and reestablishes redundancy. There must be enough free disk space in the remaining disk drives to restore the redundancy or the rebalance may fail with an ORA-15041. For more information, see Section 4.6.2, "Oracle Storage Grid Best Practices for Planned Maintenance" Note: External redundancy disk groups should use mirroring in the storage array to protect from disk failure. Disk failures should not be exposed to Oracle ASM. Perform Data Guard failover or local recovery as described in Section 13.2.5.3, "Data Area Disk Group Failure"
Perform local recovery or Data Guard failover as described in Section 13.2.5.4, "Fast Recovery Area Disk Group Failure"
If the primary database is an Oracle RAC database, then application failover occurs automatically and clients connected to the database instance reconnect to remaining instances. Thus, the service is provided by other instances in the cluster and processing continues. The recovery time typically occurs in seconds. If the primary database is not an Oracle RAC database, then an Oracle ASM instance failure shuts down the entire database. If the configuration uses Oracle Data Guard and fast-start failover is enabled, a database failover is triggered automatically and clients automatically reconnect to the new primary database after the failover completes. The recovery time is the amount of time it takes to complete an automatic Data Guard fast-start failover operation. If fast-start failover is not configured, then you must recover from this outage by either restarting the Oracle ASM and database instances manually, or by performing a manual Data Guard failover. If the configuration includes neither Oracle RAC nor Data Guard, then you must manually restart the Oracle ASM instance and database instances. The recovery time depends on how long it takes to perform these tasks. If an Oracle ASM disk group is configured as an external redundancy type, then a failure of a single disk is handled by the storage array and should not be seen by the Oracle ASM instance. All Oracle ASM and database operations using the disk group continue normally. However, if the failure of an external redundancy disk group is seen by the Oracle ASM instance, then the Oracle ASM instance takes the disk group offline immediately, causing Oracle instances accessing the disk group to crash. If the disk failure is temporary, then you can restart Oracle ASM and the database instances and crash recovery occurs after the disk group is brought back online. If an Oracle ASM disk group is configured as a normal or a high-redundancy type, then disk failure is handled transparently by Oracle ASM and the databases accessing the disk group are not affected. An Oracle ASM instance automatically starts an Oracle ASM rebalance operation to distribute the data of one or more failed disks to the remaining, intact disks of the Oracle ASM disk group. While the rebalance operation is in progress, subsequent disk failures may affect disk group availability if the disk contains data that has yet to be remirrored. When the rebalance operation completes successfully, the Oracle ASM disk group is no longer at risk in the event of a subsequent failure. Multiple disk failures are handled similarly, provided the failures affect only one failure group in an Oracle ASM disk group with normal redundancy. The failure of multiple disks in multiple failure groups where a primary extent and all of its mirrors have been lost causes the disk group to go offline. Figure 13-3 shows Enterprise Manager reporting disk failures. Five of 14 alerts are shown. The five alerts shown are Offline messages for Disk RECO2. Description of "Figure 13-3 Enterprise Manager Reports Disk Failures"
Figure 13-4 shows Enterprise Manager reporting the status of data area disk group DATA, database Data Guard disk group DBFS_DG, and recovery area disk group RECO. 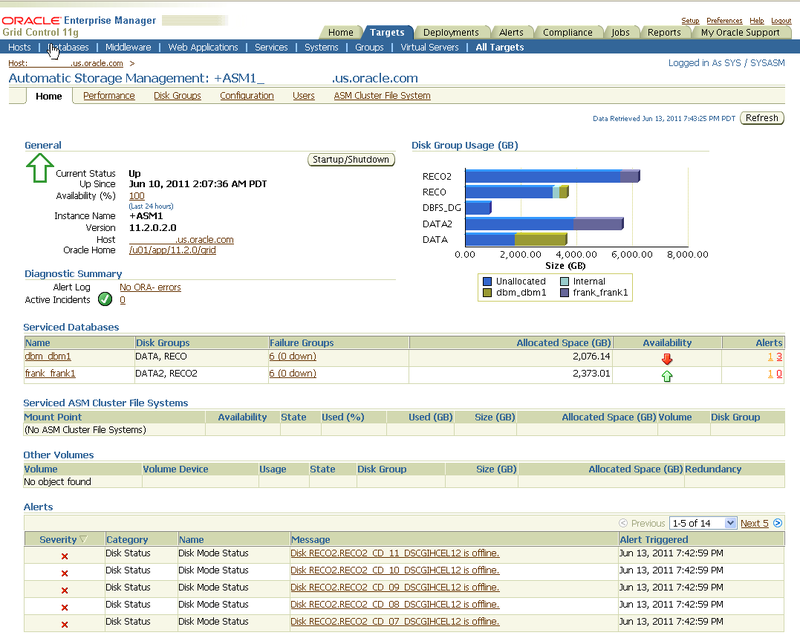 Description of "Figure 13-4 Enterprise Manager Reports Oracle ASM Disk Groups Status"
Figure 13-5 shows Enterprise Manager reporting a pending REBAL operation on the DATA disk group. The operation is almost done, as shown in % Complete, and the Remaining Time is estimated to be 0 minutes. Description of "Figure 13-5 Enterprise Manager Reports Pending REBAL Operation"
A data area disk group failure should occur only when there have been multiple failures. For example, if the data area disk group is defined as external redundancy, a single-disk failure should not be exposed to Oracle ASM. However, multiple disk failures in a storage array may be seen by Oracle ASM causing the disk group to go offline. Similarly, multiple disk failures in different failure groups in a normal or high-redundancy disk group may cause the disk group to go offline. When one or more disks fail in a normal or high redundancy disk group, and the Oracle ASM disk group is accessible, there is no loss of data and no immediate loss of accessibility. An Oracle ASM instance automatically starts an Oracle ASM rebalance operation to distribute the data on the one or more failed disks to the disks that remain intact in the Oracle ASM disk group. When the rebalance operation completes successfully, the Oracle ASM disk group is no longer at risk if a second failure occurs. There must be enough free disk space on the remaining disks in the disk group for the rebalance to complete successfully. Table 13-4 summarizes the possible solutions for recovering from a data area disk group failure. If Data Guard is being used and fast-start failover is configured, then an automatic failover occurs when the database shuts down due to the data area disk group going offline. If fast-start failover is not configured, then perform a manual failover. If you decide to perform a Data Guard failover then the recovery time objective (RTO) is expressed in terms of minutes or seconds, depending on the presence of the Data Guard observer process and fast-start failover. However, if a manual failover occurs and not all data is available on the standby site, then data loss might result. After Data Guard failover has completed and the application is available, you must resolve the data area disk group failure. Continue with the following "Local Recovery Steps" procedure to resolve the Oracle ASM disk group failure. Because the loss affects only the data-area disk group, there is no loss of data. All transactions are recorded in the Oracle redo log members that reside in the fast recovery area, so complete media recovery is possible. If you are not using Data Guard, then perform the following local recovery steps. The time required to perform local recovery depends on how long it takes to restore and recover the database. There is no data loss when performing local recovery. If you have performed an Oracle Data Guard failover to a new primary database, then you can now use the following procedure to restore and sync the Data Guard setup. Also, see Section 13.3.2, "Restoring a Standby Database After a Failover". When the fast recovery-area disk group fails, the database crashes because the control file member usually resides in the fast recovery area and Oracle requires that all control file members are accessible. The fast recovery area can also contain the flashback logs, redo log members, and all backup files. Because the failure affects only the fast recovery-area disk group, there is no loss of data. No database media recovery is required, because the data files and the online redo log files are still present and available in the data area. A fast recovery area disk group failure typically occurs only when there have been multiple failures. For example, if the fast recovery-area disk group is defined as external redundancy, a single-disk failure should not be exposed to Oracle ASM. However, multiple disk failures in a storage array may affect Oracle ASM and cause the disk group to go offline. Similarly, multiple disk failures in different failure groups in a normal or high-redundancy disk group may cause the disk group to go offline. Table 13-5 summarizes possible solutions when the fast recovery-area disk group fails. If you decide to perform local recovery then you must perform a fast local restart to start the primary database after removing the controlfile member that is located in the fast recovery area from the init.ora and allocate another disk group as the fast recovery area for archiving. However, this is a temporary fix until you create a fast recovery area to replace the failed storage components. Oracle recommends using the Local Recovery Steps. For more information, see "Data Guard Role Transition for Fast Recovery Area Disk Group Failure Local Recovery Steps". If you decide to perform a Data Guard role transition then the recovery time objective (RTO) can be expressed in terms of seconds or minutes, depending on the presence of the Data Guard observer process and fast-start failover. Temporarily start the primary database by removing the controlfile member and pointing to a temporary fast recovery area (file system) in the SPFILE. Perform a Data Guard switchover to ensure no data loss. After the switchover has completed and the application is available, resolve the fast recovery area disk group failure. Shut down the affected database and continue by using the instructions in the Local Recovery Steps to resolve the Oracle ASM disk group failure. For more information, see "Data Guard Role Transition for Fast Recovery Area Disk Group Failure Local Recovery Steps". If you performed an Oracle Data Guard failover to a new primary database, then you cannot use this procedure to reintroduce the original primary database as a standby database. This is because Flashback Database log files that are required as part of reintroducing the database have been lost. You must perform a full reinstatement of the standby database. In the example, the type variable is a placeholder for both LIST EXPIRED BACKUP and LIST EXPIRED COPY commands, and also for the DELETE EXPIRED BACKUP and DELETE EXPIRED COPY commands. You should run all of these commands now. A data block is corrupted when it is not in a recognized Oracle Database format, or its contents are not internally consistent. Data block corruption can damage internal Oracle control information or application and user data, leading to crippling loss of critical data and services. The Oracle Database corruption prevention, detection, and repair capabilities are built on internal knowledge of the data and transactions it protects, and on the intelligent integration of its comprehensive high availability solutions. For more information, see Section 5.1.6, "Protect Against Data Corruption". The recovery process begins when you either suspect or discover a block corruption (for example: ORA-1578, ORA-752, and ORA-600 ). Once a corrupt block is found, Oracle provides various techniques for recovering from most block corruptions. Data Recovery Advisor is the easiest way to diagnose and repair most problems. For more information, see Section 13.2.6.1, "Use Data Recovery Advisor". Active Data Guard can automatically repair corrupt data blocks in a primary or standby database. For more information, see Section 13.2.6.2, "Use Active Data Guard". RMAN block media recovery can repair individual corrupted blocks by retrieving the blocks from good backups. For more information, see Section 13.2.6.3, "Use RMAN and Block Media Recovery". Data Guard switchover or failover to a standby database. For more information, see Section 13.2.6.2.2, "Extracting Data from a Physical Standby Databases". Data File Media Recovery with RMAN. For more information, see Section 13.2.6.3, "Use RMAN and Block Media Recovery"
Whatever method you use to recover corrupted blocks, you first must analyze the type and degree of corruption to perform the recovery. Implementing the optimal techniques to prevent and prepare for data corruptions can save time, effort, and stress when dealing with the possible consequences-lost data and downtime. Data Recovery Advisor has both a command-line and GUI interface. The GUI interface is available when you click Perform Recovery with Oracle Enterprise Manager Database Control (Support Workbench); this allows you use Data Recovery Advisor. Using the RMAN command-line interface, the Data Recovery Advisor commands include: LIST FAILURE, ADVISE FAILURE, REPAIR FAILURE, and CHANGE FAILURE. If the Data Recover Advisor fixes the problem, then there is no need to continue with any further recovery methods. However, continue to periodically check the alert log for any ORA- errors and any corruption warnings on the primary and standby databases. While the database is operational and corruption is detected, corruption errors are recorded as ORA-600 or ORA-01578 in the alert log. In the current release, Data Recovery Advisor only supports single-instance databases. Oracle RAC databases are not supported. See Oracle Database Backup and Recovery User's Guide for more information about Data Recovery Advisor supported database configurations. Section 5.2.2, "Use Data Recovery Adviser to Detect, Analyze and Repair Data Failures"
Alternatively, if the corruption is widespread, you may choose to failover or switchover to the standby database while you make repairs to the primary database. For more information, see Section 13.2.6.4, "Perform a Data Guard Role Transition". Starting in Oracle Database 11g Release 2 (11.2), the primary database automatically attempts to repair a corrupted block in real time by fetching a good version of the same block from a physical standby database. This capability is referred to as Automatic Block Repair; Automatic Block Repair allows corrupt data blocks to be automatically repaired as soon as the corruption is detected. Automatic Block Repair reduces the amount of time that data is inaccessible due to block corruption and reduces block recovery time by using up-to-date good blocks in real-time, as opposed to retrieving blocks from disk or tape backups, or from Flashback logs. Thus, with Automatic Block Repair you use an Oracle Active Data Guard standby database for automatic repair of data corruptions detected by the primary database. Additionally if the corruption is discovered on an Active Data Guard physical standby database the corruption is automatically repaired with a good block from the Primary. Both of these operations are transparent to the applications. Automatic Block Repair requires the use of the Oracle Active Data Guard option. You can use a Data Guard physical standby database to repair data file wide block corruption on the primary database by replacing the corrupted data files with good copies from the standby database. Once the files are restored on the primary database, data file or tablespace recovery makes the data files consistent with the rest of the database. Block media recovery recovers one block or a set of data blocks marked "media corrupt" in a data file by using the RMAN RECOVER BLOCK command. When a small number of data blocks are marked media corrupt and require media recovery, you can selectively restore and recover damaged blocks rather than whole data files. Block media recovery minimizes redo application time and avoids I/O overhead during recovery. Block media recovery also enables affected data files to remain online during recovery of the corrupt blocks. The corrupt blocks, however, remain unavailable until they are completely recovered. A small number of blocks require media recovery and you know which blocks need recovery. Blocks are marked corrupt (you can verify this with the RMAN VALIDATE CHECK LOGICAL command). The backup file for the corrupted data file is available locally or can be retrieved from a remote location. Do not use block media recovery to recover from user errors or software bugs that cause logical corruption where the data blocks are intact. If a significant portion of the data file is corrupt or if the amount of corruption is unknown, then use either RMAN to restore the file from a backup or switch to an on disk image copy, or switchover to your Data Guard standby database. After a corrupt block is repaired, the row identifying this corrupted block is deleted from the V$DATABASE_BLOCK_CORRUPTION view. The database is down or when the database is up but the application is unavailable because of data corruption or failure, and the time to restore and recover locally is long or unknown. Recovering locally takes longer than the business service-level agreement or RTO. If you do not have a Data Guard Physical standby, then you must use traditional media recovery. Using traditional media recovery, a backup copy of one or more files is restored and then data file, tablespace, or database recovery brings the database back to a consistent state. Data file media recovery affects an entire data file or set of data files for a database by using the RMAN RECOVER command. When a large or unknown number of data blocks are marked "media corrupt" and require media recovery, or when an entire file is lost, you must restore and recover the applicable data files. Oracle Flashback technology revolutionizes data recovery. Before Flashback technology, it took seconds to damage a database but from hours to days to recover it. With Flashback technology, the time to correct errors can be as short as the time it took to make the error. Fixing human errors that require rewinding the database, table, transaction, or row level changes to a previous point in time is easy and does not require any database or object restoration. Flashback technology provides fine-grained analysis and repair for localized damage such as erroneous row deletion. Flashback technology also enables correction of more widespread damage such as accidentally running the wrong application batch job. Furthermore, Flashback technology is exponentially faster than a database restoration. Flashback technologies cannot be used for media or data corruption such as block corruption, bad disks, or file deletions. See Section 13.2.2, "Database Failover with a Standby Database" to repair these outages. For information about Flashback Database configuration best practices, see Section 5.1.4, "Enable Flashback Database"
Table 13-6 summarizes the Flashback solutions for outage varying in scope from destroying a row, such as through a bad update, to destroying a whole database (such as by deleting all the underlying files at the operating system level). See Also: Section 13.2.7.2, "Resolving Row and Transaction Inconsistencies"
See Also: Section 13.2.7.1, "Resolving Table Inconsistencies"
See Also: Section 13.2.7.3, "Resolving Database-Wide Inconsistencies"
See Also: Section 13.2.7.4, "Resolving One or More Tablespace Inconsistencies"
Table 13-7 summarizes each Flashback feature. Flashback Query enables you to view data at an earlier point in time. You can use it to view and reconstruct lost data that was deleted or changed by accident. Developers can use this feature to build self-service error correction into their applications, empowering end users to undo and correct their errors. Flashback Version Query uses undo data stored in the database to view the changes to one or more rows along with all the metadata of the changes. Flashback Transaction Query enables you to examine changes to the database at the transaction level. As a result, you can diagnose problems, perform analysis, and audit transactions. Flashback Transaction provides a way to roll back one or more transactions and their dependent transactions, while the database remains online. Flashback Drop provides a way to restore accidentally dropped tables. Flashback Table enables you to quickly recover a table to an earlier point in time without restoring a backup. Flashback Database enables you to quickly return the database to an earlier point in time by undoing all of the changes that have taken place since that time. This operation is fast because you do not have to restore the backups. Flashback Database uses the Oracle Database flashback logs, while all other features of flashback technology use the Oracle Database unique undo and multiversion read consistency capabilities. For more information, see the configuration best practices for the database, as documented in Section 5.1, "Database Configuration High Availability and Fast Recoverability Best Practices" to configure Flashback technologies to ensure that the resources from these solutions are available at a time of failure. In general, the recovery time when using Flashback technologies is equivalent to the time it takes to cause the human error plus the time it takes to detect the human error. Flashback technologies allow recovery up to the point that the human error occurred. Dropping or deleting database objects by accident is a common mistake. Users soon realize their mistake, but by then it is too late and there has been no way to easily recover the dropped tables and its indexes, constraints, and triggers. Objects once dropped were dropped forever. Loss of very important tables or other objects (like indexes, partitions or clusters) required DBAs to perform a point-in-time recovery, which can be time-consuming and lead to loss of recent transactions. This statement rewinds any updates to the ORDERS and ORDER_ITEMS tables that have been done between the current time and a specified timestamp in the past. Flashback Table performs this operation online and in place, and it maintains referential integrity constraints between the tables. Oracle Flashback Transaction increases availability during logical recovery by easily and quickly backing out a specific transaction or set of transactions and their dependent transactions, while the database remains online. Use the DBMS_FLASHBACK.TRANSACTION_BACKOUT() PL/SQL procedure to roll back a transaction and its dependent transactions. This procedure uses undo data to create and execute the compensating transactions that return the affected data to its pre-transaction state. Resolving row and transaction inconsistencies might require a combination of Flashback Query, Flashback Version Query, Flashback Transaction Query, and the compensating SQL statements constructed from undo statements to rectify the problem. This section describes a general approach using a human resources example to resolve row and transaction inconsistencies caused by erroneous or malicious user errors. Flashback Query enables an administrator or user to query any data from some earlier point in time. Use this feature to view and reconstruct data that might have been deleted or changed by accident. Developers can use Flashback Query to build self-service error correction into their applications, empowering end users to undo and correct their errors without delay, and freeing database administrators from having to perform this task. Flashback Query is easy to manage because the database automatically keeps the necessary information to reconstruct data for a configurable time into the past. The following partial statement displays rows from the EMPLOYEES table starting from 2:00 p.m. on June 28, 2011. This statement displays each version of the row, each entry changed by a different transaction, between 2 and 3 p.m. on June 28, 2011. A database administrator can use this to pinpoint when and how data is changed and trace it back to the user, application, or transaction. Flashback Version Query enables the database administrator to track down the source of a logical corruption in the database and correct it. It also enables application developers to debug their code. This statement shows all of the changes that resulted from this transaction. In addition, compensating SQL statements are returned and can be used to undo changes made to all rows by this transaction. Using a precision tool like Flashback Transaction Query, the database administrator and application developer can precisely diagnose and correct logical problems in the database or application. Consider a human resources (HR) example involving the SCOTT schema. The HR manager reports to the database administrator that there is a potential discrepancy in Ward's salary. Sometime before 9:00 a.m., Ward's salary was increased to $1875. The HR manager is uncertain how this occurred and wishes to know when the employee's salary was increased. In addition, he instructed his staff to reset the salary to the previous level of $1250. This was completed around 9:15 a.m. The following steps show how to approach the problem. Fortunately, the HR manager has provided information about the time when the change occurred. You can query the information as it was at 9:00 a.m. using Flashback Query. You can confirm that you have the correct employee by the fact that Ward's salary was $1875 at 09:00 a.m. Rather than using Ward's name, you can now use the employee number for subsequent investigation. Query previous rows or versions of the data to acquire transaction information. Although it is possible to restrict the row version information to a specific date or SCN range, you might want to query all the row information that is available for the employee WARD using Flashback Version Query. You can see that WARD's salary was increased from $1250 to $1875 at 08:54:49 the same morning and was subsequently reset to $1250 at approximately 09:10:09. Also, you can see that the ID of the erroneous transaction that increased WARD's salary to $1875 was "0009000500000089". Query the erroneous transaction and the scope of its effect. With the transaction information (VERSIONS_XID pseudocolumn), you can now query the database to determine the scope of the transaction, using Flashback Transaction Query. You can see that WARD's salary was not the only change that occurred in the transaction. Now you can send the information that was changed for the other four employees at the same time as employee WARD, back to the HR manager for review. Determine if the corrective statements should be executed. If the HR manager decides that the corrective changes suggested by the UNDO_SQL column are correct, then the database administrator can execute the statements individually. In this example, the query shows that the user MSMITH was responsible for the erroneous transaction. To bring an Oracle database to a previous point in time, the traditional method is point-in-time recovery. However, point-in-time recovery can take hours or even days, because it requires the whole database to be restored from backup and recovered to the point in time just before the error was introduced into the database. With the size of databases constantly growing, it takes hours or even days just to restore the whole database. Flashback Database is a strategy for doing point-in-time recovery. Flashback Database quickly rewinds an Oracle database to a previous time to correct any problems caused by logical data corruption or user error. Flashback logs are used to capture old versions of changed blocks. When recovery must be performed the flashback logs are quickly replayed to restore the database to a point in time before the error and just the changed blocks are restored. Flashback Database is extremely fast and reduces recovery time from hours to minutes. In addition, it is easy to use. A database can be recovered to 2:05 p.m. by issuing a single statement. Before the database can be recovered, all instances of the database must be shut down and one instance subsequently mounted. The following is an example of a FLASHBACK DATABASE statement. No restoration from tape, no lengthy downtime, and no complicated recovery procedures are required to use it. You can also use Flashback Database and then open the database in read-only mode and examine its contents. If you determine that you flashed back too far or not far enough, then you can reissue the FLASHBACK DATABASE statement or continue recovery to a later time to find the proper point in time before the database was damaged. Flashback Database works with a primary database, a physical standby database, or a logical standby database. Determine the time or the SCN to which to flash back the database. Verify that there is sufficient flashback log information. Open the database in read-only mode to verify that it is in the correct state. Use Data Guard to recover to the target time if the standby database lags behind the primary database or flash back to the target time if there's sufficient flashback logs on the standby. After flashing back a database, any dependent database such as a standby database must be flashed back. See Section 13.3, "Restoring Fault Tolerance". Flashback Database does not automatically fix a dropped tablespace, you can use Flashback Database to significantly reduce the downtime. You can flash back the primary database to a point before the tablespace was dropped and then restore a backup of the corresponding data files using SET NEWNAME from the affected tablespace and recover to a time before the tablespace was dropped. Recovery Manager (RMAN) automatic tablespace point-in-time recovery (TSPITR) enables you to quickly recover one or more tablespaces in a database to an earlier time without affecting the rest of the tablespaces and objects in the database. You can only use TSPITR on tablespaces whose data is completely segregated from the rest of the database. This usually means that TSPITR is something for which you must plan in advance. To recover a logical database to a point different from the rest of the physical database, when multiple logical databases exist in separate tablespaces of one physical database. For example, you maintain logical databases in the Orders and Personnel tablespaces. An incorrect batch job or DML statement corrupts the data in only one tablespace. To recover data lost after DDL operations that change the structure of tables. You cannot use Flashback Table to rewind a table to before the point of a structural change such as a truncate table operation. You perform TSPITR by using the RMAN RECOVER TABLESPACE command. Some applications may update multiple databases and participate in distributed transactions. Global consistency between the participating databases may be expected and crucial to the application. If one database in a distributed database environment requires recovery to an earlier time, it is often necessary to recover all other databases in the configuration to the same point in time when global data consistency is required by the application. Recover the database that requires the recovery operation using time-based recovery. For example, if a database must be recovered because of a media failure, then recover this database first using time-based recovery. Do not recover the other databases at this point. "RESETLOGS after complete recovery through change nnn" Recovery is complete. You have applied all the changes in the database and performed complete recovery. Do not recover any of the other databases in the distributed system because this unnecessarily removes database changes. "RESETLOGS after incomplete recovery UNTIL CHANGE nnn" You have successfully performed an incomplete recovery. Record the change number from the message and proceed to the next step. Recover or flash back all other databases in the distributed database system using change-based recovery, specifying the change number (SCN) that you recorded in Step 2. If a database that is participating in distributed transactions fails, in-doubt distributed transactions may exist in the participating databases. If the failed database recovers completely and communications resume between the databases, then the in-doubt transactions is automatically resolved by the Oracle recoverer process (RECO) process. If you cannot wait until the failed database becomes available, you can also manually commit or rollback in-doubt transactions. Whenever a component in a high availability architecture fails, the full protection, or fault tolerance, of the architecture is compromised and possible single points of failure exist until the component is repaired. Restoring the high availability architecture to full fault tolerance to reestablish full Oracle RAC, Data Guard, or MAA protection requires repairing the failed component. While full fault tolerance might be sacrificed during planned downtime, the method of repair is well understood because it is planned, the risk is controlled, and it ideally occurs at times best suited for continued application availability. However, for unplanned downtime the risk of exposure to a single point of failure must be clearly understood. Ensuring that application services fail over quickly and automatically in an Oracle RAC cluster—or between primary and secondary sites—is important when planning for both scheduled and unscheduled outages. Similarly, using Oracle RAC One Node you must ensure that applications failover to the new instance that starts if an Oracle RAC One Node instance fails. To ensure that the environment is restored to full fault tolerance after any errors or issues are corrected, it is also important to understand the steps and processes for restoring failed instances or nodes within an Oracle RAC cluster or databases between sites. After the problem that caused the initial node or instance failure has been corrected, a node or instance can be restarted and added back into the Oracle RAC environment at any time. For an Oracle RAC One Node, you can also restart a failed instance and go back to running the instance on the original node. Processing to complete the reconfiguration of a node may require additional system resources. Table 13-8 summarizes additional processing that may be required when adding a node. When using only Oracle Clusterware, there is no impact when a node joins the cluster. When using vendor clusterware, there may be performance degradation while reconfiguration occurs to add a node back into the cluster. The impact on current applications should be evaluated with a full test workload. When you restart an Oracle RAC instance, there might be some potential performance impact while lock reconfiguration takes place. The impact on current applications is usually minimal, but it should be evaluated with a full test workload. These descriptions for recovering service availability are for Oracle RAC and do not apply for Oracle RAC One Node systems. After a failed node has been brought back into the cluster and its instance has been started, Cluster Ready Services (CRS) automatically manages the virtual IP address used for the node and the services supported by that instance automatically. A particular service might or might not be started for the restored instance. The decision by CRS to start a service on the restored instance depends on how the service is configured and whether the proper number of instances are currently providing access for the service. A service is not relocated back to a preferred instance if the service is still being provided by an available instance to which it was moved by CRS when the initial failure occurred. CRS restarts services on the restored instance if the number of instances that are providing access to a service across the cluster is less than the number of preferred instances defined for the service. After CRS restarts a service on a restored instance, CRS notifies registered applications of the service change. For example, suppose the HR service is defined with instances A and B as preferred and instances C and D as available in case of a failure. If instance B fails and CRS starts the HR service on C automatically, then when instance B is restarted, the HR service remains at instance C. CRS does not automatically relocate a service back to a preferred instance. Suppose a different scenario in which the HR service is defined with instances A, B, C, and D as preferred and no instances defined as available, spreading the service across all nodes in the cluster. If instance B fails, then the HR service remains available on the remaining three nodes. CRS automatically starts the HR service on instance B when it rejoins the cluster because it is running on fewer instances than configured. CRS notifies the applications that the HR service is again available on instance B.
Oracle RAC One Node databases are administered slightly differently from Oracle RAC or single-instance databases. For administrator-managed Oracle RAC One Node databases, you must monitor the candidate node list and make sure a server is always available for failover, if possible. Candidate servers reside in the Generic server pool and the database and its services will fail over to one of those servers. After an Oracle RAC instance has been restored, additional steps might be required, depending on the current resource usage and system performance, the application configuration, and the network load balancing that has been implemented. Existing connections, that might have failed over or started as a new session, on the surviving Oracle RAC instances are not automatically redistributed or failed back to an instance that has been restarted. Failing back or redistributing users might or might not be necessary, depending on the current resource utilization and the capability of the surviving instances to adequately handle and provide acceptable response times for the workload. If the surviving Oracle RAC instances do not have adequate resources to run a full workload or to provide acceptable response times, then it might be necessary to move (disconnect and reconnect) some existing user connections to the restarted instance. In Oracle RAC One Node there is only one instance for a database (unless you are migrating). Thus an Oracle RAC One Node configuration does not require you to rethink the strategy for 'rebalancing' the connections as there is only one. Clients using Oracle RAC One Node must be able to work with FAN and other client and service facilities to be informed about the status of services. Connections are started as they are needed, on the least-used node, assuming connection load balancing has been configured. Therefore, the connections are automatically load-balanced over time. This is valuable for modularizing application and database form and function while still maintaining a consolidated data set. For cases where an application is partitioned or has a combination of partitioning and nonpartitioning, you should consider the response time and availability aspects for each service. If redistribution or failback of connections for a particular service is required, then you can rebalance workloads automatically using Oracle Universal Connection Pool (UCP). If you are using UCP, then connections are automatically redistributed to the new node. For load-balancing application services across multiple Oracle RAC instances, Oracle Net connect-time failover and connection load balancing are recommended. This feature does not require changes or modifications for failover or restoration. It is also possible to use hardware-based load balancers. However, there might be limitations in distinguishing separate application services (which is understood by Oracle Net Services) and restoring an instance or a node. For example, when a node or instance is restored and available to start receiving connections, a manual step might be required to include the restored node or instance in the hardware-based load balancer logic, whereas Oracle Net Services does not require manual reconfiguration. Table 13-9 summarizes the considerations for new and existing connections after an instance has been restored. The considerations differ depending on whether the application services are partitioned, nonpartitioned, or are a combination of both. The actual redistribution of existing connections might or might not be required depending on the resource utilization and response times. Existing sessions are not automatically relocated back to the restored instance. Use the SRVCTL utility to manually start, stop, and relocate services. See Oracle Real Application Clusters Administration and Deployment Guide "Administering Services" for more information. Automatically routes to the restored instance by using the Oracle Net Services configuration. No action is necessary unless the load must be rebalanced, because restoring the instance means that the load there is low. If the load must be rebalanced, then the same problems are encountered as if application services were partitioned. Figure 13-6 shows a two-node partitioned Oracle RAC database. Each instance services a different portion of the application (HR and Sales). Client processes connect to the appropriate instance based on the service they require. Description of "Figure 13-6 Partitioned Two-Node Oracle RAC Database"
Figure 13-7 shows what happens when one Oracle RAC instance fails. Description of "Figure 13-7 Oracle RAC Instance Failover in a Partitioned Database"
If one Oracle RAC instance fails, then the service and existing client connections can be automatically failed over to another Oracle RAC instance. In this example, the HR and Sales services are both supported by the remaining Oracle RAC instance. In addition, you can route new client connections for the Sales service to the instance now supporting this service. After the failed instance has been repaired and restored to the state shown in Figure 13-6 and the Sales service is relocated to the restored instance, then you might need to identify and failback any failed-over clients and any new clients that had connected to the Sales service on the failed-over instance. Client connections that started after the instance has been restored should automatically connect back to the original instance. Therefore, over time, as older connections disconnect, and new sessions connect to the Sales service, the client load migrates back to the restored instance. Rebalancing the load immediately after restoration depends on the resource utilization and application response times. Figure 13-8 shows a nonpartitioned application. Services are evenly distributed across both active instances. Each instance has a mix of client connections for both HR and Sales. Description of "Figure 13-8 Nonpartitioned Oracle RAC Instances"
If one Oracle RAC instance fails, then Oracle Clusterware moves the services that were running on the failed instance. If one Oracle RAC instance fails, new client connections are only accepted on the remaining instances that offers that service. After the failed instance has been repaired and restored to the state shown in Figure 13-8, some clients might have to be moved back to the restored instance. For nonpartitioned applications, identifying appropriate services is not required for rebalancing the client load among all available instances. Also, this is necessary only if a single-instance database is not able to adequately service the requests. Client connections that started after the instance has been restored should automatically connect back to the restored instance because it has a smaller load. Therefore, over time, as older connections disconnect and new sessions connect to the restored instance, the client load evenly balances again across all available Oracle RAC instances. Rebalancing the load immediately after restoration depends on the resource usage and application response times. Following unplanned downtime on a primary database that requires a failover, full fault tolerance is compromised until the standby database is reestablished. Full database protection should be restored as soon as possible. The steps for restoring fault tolerance differ slightly between physical and logical standby databases. Reinstating databases is automated if you are using Data Guard fast-start failover. After a fast-start failover completes, the observer automatically attempts to reinstate the original primary database as a standby database. Reinstatement restores high availability to the broker configuration so that, if the new primary database fails, another fast-start failover can occur. The reinstated database can act as the fast-start failover target for the primary database, making a subsequent fast-start failover possible. The standby database is a viable target of a failover when it begins applying redo data received from the new primary database. If you want to prevent automatic reinstatement (for example, to perform diagnostic or repair work after failover has completed), set the FastStartFailoverAutoReinstate configuration property to FALSE. The FastStartFailoverAutoReinstate configuration property controls whether the observer should automatically reinstate the original primary after a fast-start failover occurred because a fast-start failover was initiated due to the primary database being isolated for longer than the number of seconds specified by the FastStartFailoverThreshold property. In some cases, an automatic reinstatement might not be wanted until further diagnostic or recovery work is done. To reinstate the original primary database, the database must be started and mounted, but it cannot be opened. The broker reinstates the database as a standby database of the same type (physical or logical) as the original standby database. If the original primary database cannot be reinstated automatically, you can manually reinstate it using either the DGMGRL REINSTATE command or Enterprise Manager. Step-by-step instructions for manual reinstatement are described in Oracle Data Guard Broker. Following a fast-start failover, the observer periodically attempts to reconnect to the original primary database. When the observer regains network access to the original primary database, it initiates a request for the broker to automatically reinstate it as a standby database to the new primary. This quickly restores disaster protection and high availability for the configuration. You can enable fast-start failover from any site, including the observer site, in Enterprise Manager while connected to any database in the broker configuration. The broker simplifies switchovers and failovers by allowing you to invoke them using a single key click in Oracle Enterprise Manager, as shown in Figure 13-9. Description of "Figure 13-9 Fast-Start Failover and the Observer Are Successfully Enabled"
Furthermore, you can use Enterprise Manager to reinstate the original primary as the new standby. Figure 13-10 shows an example of the warning message that shows in Enterprise Manager when a reinstatement is needed. Description of "Figure 13-10 Reinstating the Original Primary Database After a Fast-Start Failover"
Follow the steps in Section 13.2.5.3, "Data Area Disk Group Failure" or Section 13.2.5.4, "Fast Recovery Area Disk Group Failure". After performing the planned maintenance on the secondary site, the standby database and log apply services must be restarted, and then the Data Guard redo transport services automatically catch up the standby database with the primary database. You can use Enterprise Manager and the broker to monitor the Data Guard state. The following steps can be accomplished manually (as described below) or automatically using Enterprise Manager. You might have to restore the standby database from local backups, local tape backups, or from the primary site backups if the data in the secondary site has been damaged. Re-create the standby database from the new primary database by following the steps for creating a standby database in Oracle Data Guard Concepts and Administration. After the standby database has been reestablished, start the standby database. If you had to change the protection mode of the primary database from maximum protection to either maximum availability or maximum performance because of the standby database outage, then change the primary database protection mode back to maximum protection depending on your business requirements. Following unplanned downtime on the standby database that requires a full or partial data file restoration (such as data or media failure), full fault tolerance is compromised until the standby database is brought back into service. Full database protection should be restored as soon as possible. If you had to change the protection mode of the primary database from maximum protection to either maximum availability or maximum performance because of the standby database outage, then change the primary database protection mode back to maximum protection (depending on your business requirements). If the primary database is activated because it was flashed back to correct a logical error or because it was restored and recovered to a point in time, then the corresponding standby database might require additional maintenance. No additional work is required if the primary database completed recovery with no resetlogs. After opening the primary database with the RESETLOGS option, execute the queries shown in Table 13-12. Table 13-13 shows the actions you take to restore fault tolerance if the standby database is behind the primary database's resetlogs SCN. Ensure that the standby database has received an archived redo log file from the primary database. See Also: "Verify redo transport services on the primary database"
Table 13-14 shows the actions you take to restore fault tolerance if the standby database is ahead of the primary database's resetlogs SCN. Issue the SHUTDOWN IMMEDIATE statement, if necessary. Issue the STARTUP MOUNT statement. Issue the FLASHBACK DATABASE TO SCN flashback_scn statement where flashback_scn is the SCN returned from the primary database query in Table 13-12. The SCN returned from the primary database query is 2 less than the RESETLOGS_CHANGE#. Issue the FLASHBACK DATABASE TO SCN resetlogs_change#_minus_2 statement. Determine the SCN at the primary database. Flash back the logical standby to the TARGET_SCN returned. If a dual failure affecting both the standby and primary databases occurs, then you must re-create the primary database first. Because the sites are identical, the primary database can be created wherever the most recent backup resides. Table 13-15 summarizes the recovery strategy depending on the type of backups that are available. Restore backup from the primary database. Recover and activate the database as the new primary database. Local backup only on standby database. Tape backups on standby database. Restore the local standby backup to the standby database. Recover and activate the database as the new primary database. Restore tape backups locally. Recover the database and activate it as the new primary database.